CSA stands for "Community Supported Agriculture" and it's one of many ways for the community to support a local farmer. Orange Circle Farm is a CSA farm. 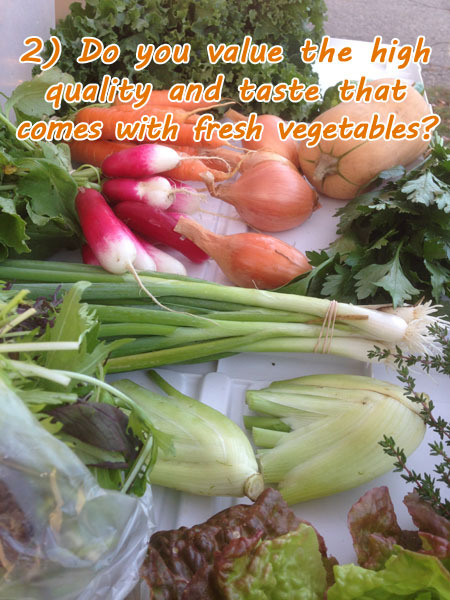 Of all the ways to market our vegetables (farmers' markets, restaurants, grocery stores, etc. ), the CSA is our primary focus accounting for over 90% of the farm's income each year. The CSA is a great fit for our farm, but is it a great fit for you? How is it different than supporting a farmer by going to a farmers' market or roadside stand? The truth is that the CSA is not a good fit for everyone and that's perfectly okay. Over the last five years, we've learned a lot about our customers who thrive in the CSA and return year after year, while others discover that they prefer going to market instead. Here are 7 questions that you should ask yourself while you're considering joining our CSA. When we asked last year's members to define the CSA in a nutshell, we were shocked to see how similar everyone answers were. It's not a coincidence. That strong sense of support is inherent in the CSA model. No other way of eating involves committing months in advance to one local farm to provide the vegetables you'll eat from June through mid-October. It's a commitment that involves a bit of risk. Extreme conditions such as droughts, floods, hail, pests and diseases always have potential to cut harvests short. CSA members understand that risk but choose to have the farmer's back, no matter what. They value directly supporting their farmer as much as they value getting the full financial value of their share. Once you join the CSA, we try to cultivate a relationship with you too. Beyond our commitment to providing you with the highest quality vegetables, we offer events on the farm, informative newsletters, a private Facebook group and more to help you succeed at getting the most from your CSA experience. Some CSA members are great cooks. Some aren't. What they all share is that they value using real, fresh ingredients and recognize the HUGE difference they make in any meal. I love hearing from members that their kids won't eat tomatoes or carrots or whatever other vegetable that didn't come from their CSA share. For them, it’s not decision based in economics, ecology, sociology or politics. It’s simply based on taste. There is a palatable difference with these fresh vegetables and that's part of what you're paying for. Members who find their weekly pickup time/location to be relatively convenient are usually the most likely to satisfied with their CSA experience. It's 2019. Convenience matters. We offer several pickup times and locations through the week in order to reach people where they are. Hopefully one of those times/locations fits into your schedule rather easily. The reality here is that the pickup windows are limited to the times stated on the farm website. I often give the example of a concert. You bought the ticket, but if you show up three hours (or two days) later you shouldn't expect to see a show. While alternate pickup options can sometimes be accommodated, they often don't work out. So if one of our many pickup options fits into your life with ease, the CSA is a great, convenient way to include a weekly supply of fresh veggies into your routine. Take a quick scan of all the different veggies we're aiming to harvest this year. Though most of them are likely to be familiar, there's probably a few that you pop out as things you don’t use and wouldn't normally buy for yourself at a market or grocery store. For CSA members, those few foreign items aren't greeted with fear but as an inspiration for creativity in their cooking and eating. And remember, you're not on your own here. Our weekly newsletters include recipes and techniques that target those less familiar and less popular veggies. Also the private CSA Facebook group give you access to dozens of other members working with the same items. CSA members sometimes refer to me as "Veggie Claus". In our CSA, we pack the shares so you don’t get to choose which items you want each week. And you often don't know which delicious veggies are in your share each week until you pick it up. That’s the nature of working with nature. CSA members welcome this dynamic. They appreciate not having to make choices on the spot and simply being ‘forced’ to find inspiration in the ingredients they get. Others find it stressful because it’s too hard to plan a menu around. Are you able to give up some control of your menu and accept the uncertainty that nature offers? If so, the CSA may be just the thing for you. If you've never been in a CSA before, it'll probably take some time to get used to the structure. You’ll be inviting these tasty ingredients into your home each week, not just for special occasions or because you happen to make it to market that morning. After talking with many members after their first year, they usually talk about their difficulties getting through the entire share each week, especially in the first half of the season. This is a fundamental and long-term change to how you eat. You'll have to keep an open mind during this new adventure and go easy on yourself if you end up wasting some food in the beginning. It gets easier week to week and month to month. Understand that your choice to source your food and eat this way will require some new skills that take some time and effort to learn. We'll teach you along the way, and if you're committed to learning, you can totally do it! So do you have the resolve to work at eating the CSA way? You may be tempted to look at the cost of joining the CSA and compare that to grocery store prices. I'll confirm your suspicion. Our vegetables costs more. I can go into all the reasons why, but the truth is that most experienced CSA members find that to be a false comparison. The higher quality of produce, the freshness of being grown locally, the inclusion in a community of like-minded members, the access to the farmer who grows for you, the connection to a piece of farmland you can visit and the support to help you succeed in eating this way just to name a few. CSA members appreciate these added values, and are willing to pay for them. In many ways, I can tell you that the CSA is a deal of a lifetime. But if you think a carrot is just a carrot and should cost the same as all other carrots, you're probably not ready for the CSA experience just yet. That's it. Did you pass? The CSA has the ability to change the way you eat forever! But remember, it is just one of several ways to support local farmers. And just because it's the only way to get veggies from this farm, you shouldn't feel bad if it doesn't fit your style. The CSA experience is largely shaped by your expectations. Before committing to the CSA, be sure that your expectations align with the CSA philosophy.